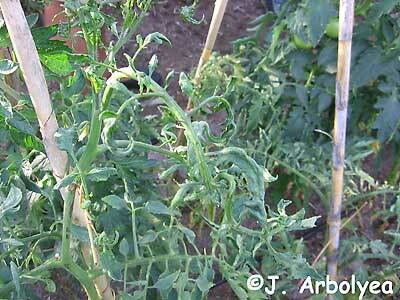 Is this Herbicide Damage or Virus Affecting my Tomatoes? My tomatoes were doing fine until I transplanted them in a new garden bed that has new soil and compost. I have grown tomatoes successfully for the last 3 years and this is the first time I have seen this. I am unable to conclude if this is Herbicide contamination from the soil or a disease. Any thoughts? Re: Is this Herbicide Damage or Virus Affecting my Tomatoes? Where did the compost come from? 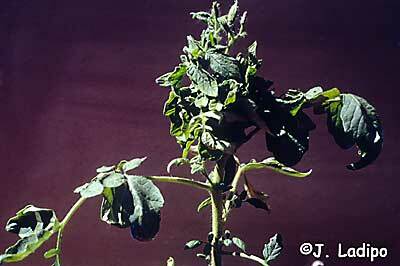 Some leaf curl can be from heat stress or insects. Can't say. I sometimes poke in a wooden shingle in front of a new transplant on the sunny side to give it a little shade. Its pretty harsh to the little plants that have not had full sun, to be put right out in full sunshine. Ceder shingle sun blocks... that is a GOOD idea! This was a problem in zone 8b last year. The tomato crop here was very poor. I found this to be my problem. Water... I planted all my heirloom tomatoes near my well pump . The others was on city water. The heirlooms thrived . The others died . Talking with locals and counties next to us , I asked what they watered with . city water. So the sun yes it can knock down plants . but on young plants try and set a few gallons of water open to the air for 24 hours to neutralize the chlorine and other chemicals in the water . This year I ran from my well pump to my gardening areas..... so far thriving . It has been relatively cool here in NC for the start and the rain has been pretty good too. But the same thing is happening to my peppers and chilies I planted. The beans are stunted and the new growth is clumped. The leaves are not really limp. They are firm but tightly curled and the new shoots are stunted. I transplanted some of the chilies yesterday evening to see if they will do better in soil that is not from the same source. My gardener who helped me set up the bed brought in the compost and soil. Show us a pic of the beans. My understanding is that beans and peas are particularly sensitive to a certain kind of herbicide and is often used to TEST for residues because they germinate quickly and immediately show damage. Maybe their appearance would be more definitive than the tomato's. I've never actually seen them but maybe others have. I posted pictures of herbicide damage from the Cornell's library in another thread. Let me see if I can find it. applestar wrote: Do they look anything like these? Look more like the second picture for sure. Thanks for sharing these pictures. What is affecting my tomatoes (disease)?! 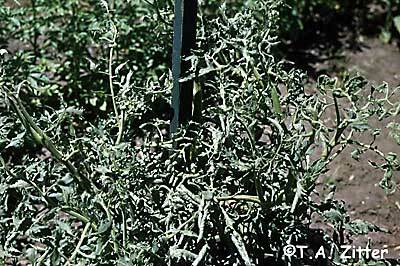 Tomatoes died due to Grazeon herbicide drift - soil affected?